FRENCH ELECTIONS: We are closely watching the French Presidential election process. 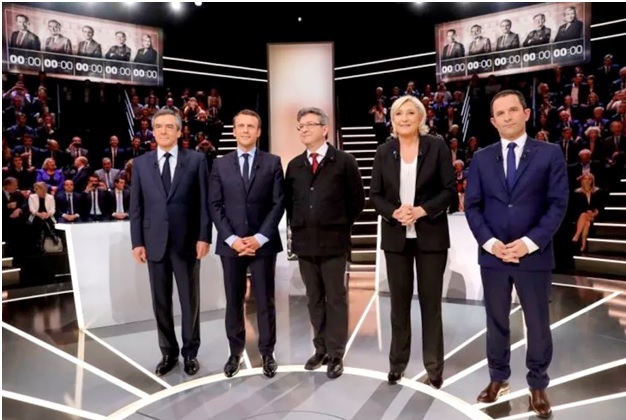 It was the burkini that brought Monday night’s debate to life between the five main presidential candidates for next month’s French election. For the first hour of the televised debate there had been much posturing and postulating but no sharp exchanges. That changed when Marine Le Pen accused Emmanuel Macron of turning a blind eye to the burkini, the Islamic swimwear that last summer caused such controversy in France. Macron rejected the charge, telling Le Pen in a forceful exchange she was a dangerous provocateur. The centrist candidate, who claims to be ‘neither left nor right’, then went on the counter-attack, accusing the National Front leader of sowing divisions within society by attempting to make four million French Muslims ‘enemies of the Republic’. It was one of the few memorable confrontations during three hours of debate that told us little that we that we didn’t already know. Jean-Luc Melenchon, the far-left candidate, is a Gallic George Galloway, a sharp wit to accompany his crackpot ideology, while his Socialist rival Benoit Hamon bore more than a passing resemblance to a ventriloquist’s dummy so leaden was his performance. Francois Fillon, the centre-right candidate whose ethics have dominated the headlines in recent weeks, seemed relieved to be able to finally discuss campaign issues, but he lacked sparkle as he tried to convey a statesmanlike air. Le Pen, in contrast to the polished prose of Macron, radiated pugnacity, snorting with derision when at one stage Hamon said immigration to France had remained stable over thirty years. It doubtless delighted her supporters but what will it do to the undecided voter who fears Macron is right when he accuses the National Front leader of seeking to divide still further a country already struggling with its identity? The other issue on which Le Pen took aim at Macron was Europe. ‘I want to be the president of the French Republic’, she said in her opening address, ‘I don’t aspire to govern what has become a region, a vague region of the European Union. I don’t want to be Madame Merkel’s vice-chancellor’. The unashamedly pro-Europe Macron mocked Le Pen’s wish to leave the EU, pointing out that across the Channel ‘all those people who said Brexit would make everything possible, the day after [the vote] they did a runner’. Francois Fillon, who shares Macron’s view on the benefits of the EU, joined in the attack, accusing Le Pen of wanting ‘to drag the country into social and economic chaos’. ‘That’s called Project Fear, Mr Fillon’, retorted Le Pen. ‘It was used before Brexit’. As for what the people made of it, that depends where you look on Tuesday morning. An online poll in Le Parisien, the daily newspaper for the French capital, had Mélenchon way out on front, while readers of the centre-right Le Figaro believed Fillon had scored best. A poll for the TV station, BFMTV had Macron the winner. In truth, no one candidate stood out from their rivals but they’ll have another chance to impress on April 4th in the second debate and a third opportunity a week later. Not that all the French will tune in. Purchasing a selection of newspapers from my local kiosk in Paris this morning I asked the vendor if he’d watched the debate. ‘Are you serious!’ he exclaimed. ‘I’ve got better things to do with my time’. WHY WATCH EUROPEAN ELECTIONS? Eventually, in the not too distant future– we are told that political turmoil in Europe (Revelation 17), will lead to a newly formed confederation of states in Europe that will be beastlike (terribly destructive). European leaders will then choose one single dictator, the prophesied “beast,” which will set up a system that will be extremely brutal (verses 12 and 13). European extremism will return. Jesus Christ himself will destroy this end-time empire, and then Christ will establish the Kingdom of God on earth, that will rule the nations with justice and force. Europe is important—we will continue to watch this year’s important election process on the Continent. The current rise of nationalism in Europe is the result of European institutions’ failure to cut high unemployment and control the flow of immigrants coming into the EU. Eight years after 2008, Europe still has not solved its economic problems. 18 months after the massive invasion of refugees into Europe, there is still no clear and efficient policy to address the issue of refugees. Adding to the political chaos in Europe, and also troubling German, French and Italian leaders, is that Donald Trump has challenged the idea that free trade is always beneficial; and he is even questioning NATO. Right-wing parties across Europe are asking the same questions. We are seeing a return to nationalism in Europe and the United States, because to many in Europe and America, internationalism, which became popular after World War II, is viewed as smothering individual economies and neutering national sovereignty. Meanwhile, EU leader Germany is still insisting Russia to do more on its end to apply the Minsk rules, the understanding intended to end the conflict in eastern Ukraine signed by Kiev, Moscow and Ukrainian separatists. But EU sanctions are becoming a source of division within the bloc, divisions that could widen depending on the outcome of upcoming elections in Europe. This leaves Ukraine in a dangerous position in regards to the EU. Kiev is now looking for additional alliances with countries like Poland and the Baltics. What is of great interest to me in the coming weeks, is Angela Merkel’s visit to the United States. 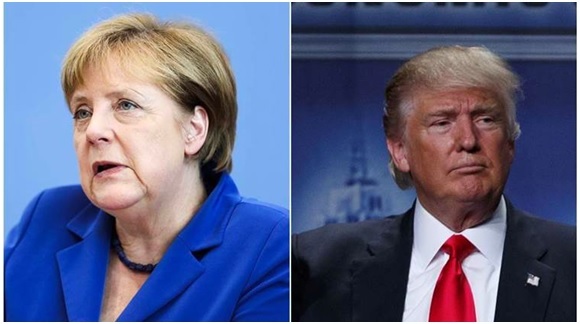 German Chancellor Angela Merkel will visit the United States on March 14th to meet with U.S. President Donald Trump, what Reuters reported on March 3rd. The March meeting will occur ahead of a gathering of G-20 finance ministers in Germany. The American President will visit Germany in July for a G-20 summit. Germany, like many European nations –their leaders fear that the policies of the new U.S. government could create havoc in the global order — Germany (Angela Merkel) is especially concerned about what “Trump may do”. The source of Germany’s greatest fear is German exports. Angela Merkel will do everything possible to avert a trade war with the United States, such a war would be devastating to the Germany economy. The German economy is heavily dependent upon its ability to export German goods.